Samburu Intrepids is a lush oasis on the banks of the great Uaso Nyiro River in Samburu Game Reserve. The tented luxury camp is a delight to be in – deliciously cooled by the river breeze and the forest. The camp sits on raised decks overlooking the brown river where the elephants sometimes make an appearance or the crocodiles come out to lounge by the river’s banks. 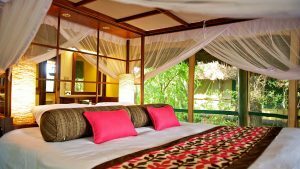 Samburu Intrepids has newly renovated tents, with four-poster king size beds, choice of game viewing in Samburu or Buffalo Springs Reserves, cultural immersions in pristine ways of neighboring Samburu tribesmen, clear Equatorial night skies for astronomy, open sided safari jeeps for best game viewing in the picturesque mountainous landscape with knowledgeable and highly-certified guides and the best kids clubs in the region for cultural and wildlife “edu-tainment”.